Forty years ago a cup of coffee, and by coffee I mean a cup of lukewarm water (if you were lucky) and an oblong pack of "three in one", just referred to as “Nescafe”. They had enough sugar in them to send you into a diabetic coma. Back then, the closest thing you were going to get to a true brewed cup of coffee was kafae yen or kafae boran, coffee steeped in boiling water in a sock filter and served with condensed milk. It was made from Robusta coffee mixed with corn, soy beans and other supplements. It came to Thailand during WWII when coffee was precious and was sold in small stalls and carts many places around the city. The carts still exist, but today a cup of kafae sot (fresh coffee) is as common as a dish of pad Thai. Chiang Mai is known as the coffee capital of Thailand. It is the home of the Arabica Association of Thailand and the Royal Coffee Research Centre. Coffee, as well as tea, was introduced to the hill tribes in the mountainous regions around Chiang Mai in the 1980s as a cash crop alternative to growing opium poppies. The government introduce a strain of Arabica from Central America that was well suited to the region and thrived. Now Thailand is the third leading coffee producer in Asia. While originally seen as a foreign export, the coffee culture slowly took root in Thailand. Individual cafés started to pop up around the city. At first, by expats who had settled in the city but soon everyone was in the game due to the low startup cost. Many of the shops had a very unThai appearance as new owners tried to replicate what they had seen travelling abroad. The popularity of coffee and the café culture shows the rise of the middle class in Thailand and its discretionary purchasing power. Just several decades ago, a cup of coffee at a café would be considered a luxury more reserved for foreigners. The rise of coffee went hand in hand in Thailand with the introduction of the internet. Internet in the home was a luxury back in 90s that very few Thais could afford and usually wasn’t very dependable. Internet cafes were everywhere and students drank coffee to recharge their batteries for marathon sessions of video games. 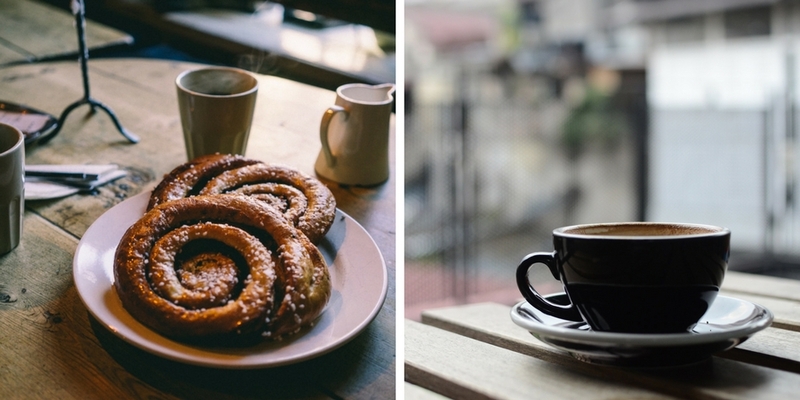 Many people started going to coffee shops in college as appropriate place to meet a date. Chiang Mai has developed a cafe culture different from Bangkok and the rest of Thailand over the years. Maybe it is because Chiang Mai lies in the center of coffee agriculture in Thailand. Or maybe it’s that the North is just a bit more laid back. The North has always been a favourite place for Thais to retire from the hustle and bustle of Bangkok. Chiang Mai residents may while away hours in a café reading or chatting with a friend. Some winter morning in Chiang Mai, a cup of coffee can be a welcomed friend to ward off a chill. 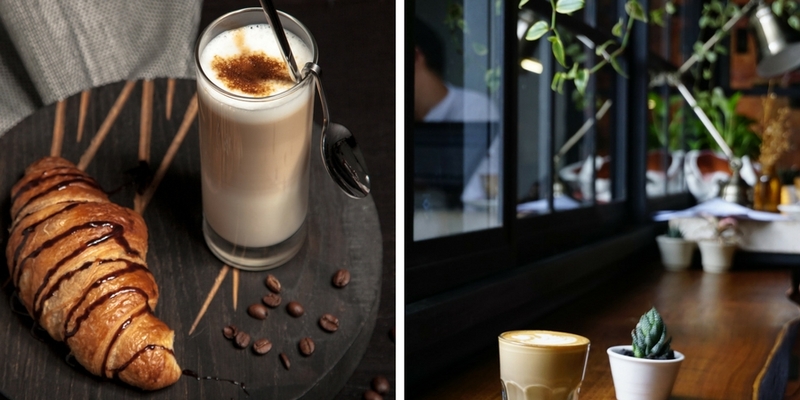 Now as Chiang Mai’s coffee culture matures, coffee aficionados are coming up with their own special coffee concoctions and bean blends to set them apart from the competitions. There is a vast array of cafés, each drawing its own following. The starving student, the fashionista, the artist, the connoisseur, all have their go-to java fix. We’ll take a look first at some of the chain cafes in Chiang Mai and then review some the best independent cafés that growing trends in town. There is no question that the majority of coffee sold in Chiang Mai is at chain cafés. There are several global coffee franchises in Chiang Mai as well as KFC and omnipresent McDonalds where one can get a dependable cup of drip coffee. The chains are clean, standardise and some would say soulless where you will probably find more foreigners than Thais. One might ask if this is what you are looking for, why did you come to Thailand. But the staff know what they are doing, the blends are quality and you’ll find yourself in familiar surroundings. Moreover, the chains tend to open earlier, around six in the morning. If you do want the security of a known product then Chiang Mai’s Starbucks will not disappoint. There are ten Starbuck’s in the Chiang Mai area. For those on a budget, consider Dunkin Donuts. Dunkin Donuts what offers what many consider a great cup of coffee less pricey than Starbuck's, though still expensive by Thai standards. But as with many other food or drink venues, the Thais had no inclination to yield the field to westerners. Within three years of the first Starbucks opening in Thailand, the homegrown Wawee coffee chain opened for business. Wawee only uses beans from plantations in the mountains of Doi Chang, Doi Chiang Dao and Doi Inthanon. There are 17 outlets spread around the city, but the original on trendy Nimmandhaemin Soi remains the best with comfortable sofas and a quiet little patio in back. Thailand’s favorite hometown coffee chain is Amazon Café. Started in 2002, it dwarfs the competition and you will find Café Amazons almost everywhere in Thailand as a common fixture at most truck stops. They are the most reasonably priced chain in Thailand. There are five locations in the Chiang Mai metro area (two more on the outer circle). Another home grown franchise in Chiang Mai is Black Canyon. Black Canyon has established itself in the speciality coffee drink market promoting its own high quality coffee blends and consistency. There are twelve outlets in the Chiang Mai area. Finally, the Thai food giant S&P has entered the speciality coffee market with its Blue Cup Coffee Café. Their coffee is known to be a little stronger than other chains and many Thais like their wide selection of ice coffee drinks. And while many chain cafés seem somewhat sterile, Blue Cup attempts to create a unique somewhat eclectic motif for their cafés. While you can get coffee at many S&P restaurant, there are four independent Blue Cup Cafés somewhat clustered around Chiang Mai University on the west side of town. Everyone knows that universities are a magnet for cafes. We'll see a lot of cafés that cater specifically to students. Tucked away in a small shop in an apartment building’s ground floor, at the end of a quiet street in the busy student quarter of the University of Chiang Mai (CMU) is one of the city’s favourite cafes, Akha Ama. Founded only in 2010 by Lee Ayu, its clients are known for spending long hours with a cup of coffee pouring over books with a furrowed brow. Lee Ayu has made social empowerment and being eco-friendly a part of Akha’s business plan which plays well with their base. Akha, like many independent shops, are trying to get away from using plastic containers. Akha Ama uses coffee locally grown in the village of Maejantai. Sode Café at the back of CMU on Suthep Road is another favorite with students and has a great outdoor patio. Nearby is Sipping Coffee which has gotten the reputation as one of the coolest places in town. Roots Coffee Roaster was an early representative of a growing trend in Chiang Mai coffee culture, the micro roaster who only uses locally sources beans. They market themselves as the place to be for serious coffee drinkers who want to know about coffee. Monday to Friday, they conduct in-house classes for people who are interested in basic coffee brewing, roasting, and cupping. So if you really want to impress your friends with your coffee knowledge. If you want to purchase a cup of coffee, you have to wait until the weekends when they open their doors to the general public. Since retail brewed coffee sales are only done on the weekend to entice people to see their operation, payment is on the honor system. Other cafés for serious coffee drinkers include Ristr8to on 14 Nimmanhaemin Soi 3 Suthep Mueang (Nimmanhaemin aka Coffee Street) where experts make great unique coffee drinks in a very comfy atmosphere. It also offers coffees from around the world which is still somewhat unusual because of the high tariffs on imported coffee. Along with getting a great cup of coffee, Thais are looking for a great atmosphere to enjoy that coffee. No better example of that is the Artisan. The Artisan is littered with antiques that the owner uses to create a ship-like motif. Nothing is uniform in their eclectic array of seating and their lighting creates a warm and friendly atmosphere. Overstand Coffee also draws people to a small quiet soi in the Old City and peppers the café with local artist exhibitions. 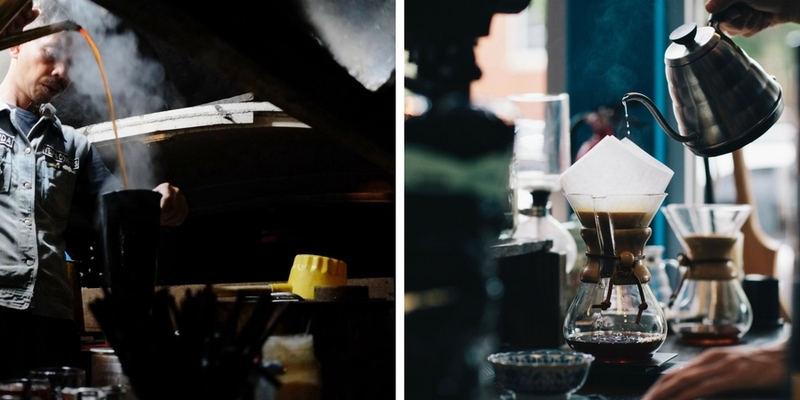 Art Roastery is another example of Chiang Mai’s search for the perfect atmosphere. But here, the Art Roastery is trying to create a natural setting, which isn’t always easy in noisy Chiang Mai. Located off Huey Kaew Road, you would not know the café was there from the road. The cafe has two buildings sitting atop of a lake and seems a world away from the busy street. Coffee Man sits on a lake in the back of CMU where you can still hear birds in the city. However, today you are more likely to meet a Chinese tourist there than a Thai student. Libaristo must also be given a mention, not only for great coffee, but for its surreal surroundings featuring a lawn full of large dancing cats. Finally, as customers have developed a taste for premium brewed coffee, many of the stores have started to offer a wide selection of high-end gear, so you too, can be a barista. Along with the previously mentioned Roots, Boncafe, located on Chang Khlan Road, has a good selection of coffee and espresso makers. If you can’t find what you’re looking for at Hillkoff, then you’re not going to find it Chiang Mai. They also have a very good selection of coffee beans for sale. Finally, Pacamara, smack in the middle of the Old City, not only has a great selection of equipment, but what some consider the best espresso in town and their own gelato. The biggest change to café culture in Chiang Mai is that it is impossible to name all the great cafés in Chiang Mai. Wherever you are in Chiang Mai, you will be able to get a pretty good cup of coffee.